I am learning to trust more and more each day. I have learned a lot here and now I’m ready to find my furever home. My foster Mom says I’m going to make some family very happy! Will it be you? I’m John Deere. 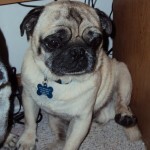 I’m 7 years young and was a breeder release Pug. I’ve been in foster care for a week learning what a pugs life should be! I love attention from my foster parents but I’m stilla little nervous about learning to trust. I’ve mastered going up stairs but not going down yet. I’m starting to learn that I’m to do my business out side but wearing a belly band inside is still a good idea. I’m friendly and love other dogs! I like going for walks but still learning to walk nice on the leash. I don’t pull though. I’m healthy up to date on my shots and was neutered. I’m active and a truly loveable guy so if your looking for a forever kind of man…that’s me!